". . . hilarious. . . I laughed so hard I scared my cat off the couch multiple times. What The Haters excels at is describing music." "Jesse Andrews’ follow-up to Me and Earl and the Dying Girl is an extremely entertaining number that focuses on a couple of jazz-camp rejects. It’s also downright hilarious when they riff on band names, new songs or just living life." "...What follows is both a classic road trip novel and a contemporary and inventive teen adventure: they play (horribly) at a Chinese food buffet, hang at a commune, and almost get shot (twice!)... Issues of race, family, and socioeconomics (Wes was adopted from Venezuela as a baby; Ash’s mom is French and her dad is a Brazilian billionaire/serial philanderer) play subtly throughout the book." "Fortunately for readers, Wes has a lively voice that moves smoothly betwen laugh-out-loud, self-conscious snark and candid, moving observations... The trio's road trip thus has all the requisite coming-of-age moments, with virginities and illustions lost and friendships, courage, and self-awarness found." "as a love letter to music and following one’s dreams, it’s just right." 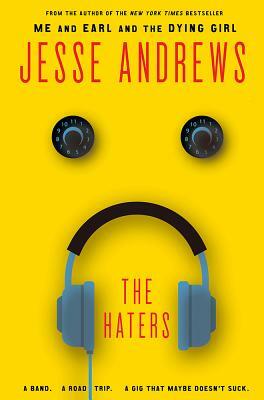 "truly hilarious….a teen road trip packed with music and drama."